Atlantic recording artist Cody Simpson has announced plans for a major North American headline tour. The 36 city “Paradise Tour,” part of AEG Lives’ worldwide touring partnership with Simpson, will get underway May 30th at The Moran Theatre in Jacksonville, Florida. Supporting Simpson on all dates will be Ryan Beatty and opener Before You Exit. Presale tickets will be available exclusively to members of The Angels & Gentlemen’s Beach Club, the official Cody Simpson Fan Club, beginning Thursday, April 25th. Remaining tickets will go on sale to the general public beginning Saturday, April 27th. 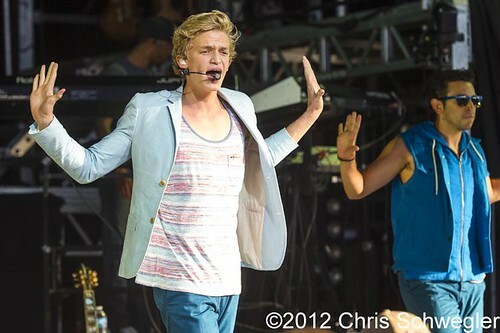 For up-to-the-minute tour and ticket information, please visit www.codysimpson.com/tour. The summer tour will be heralded by the new single, “Pretty Brown Eyes,” set for release at all DSPs on Tuesday, April 23rd. “Pretty Brown Eyes” precedes the arrival of Simpson’s much anticipated second album. The as-yet-untitled collection – which follows last year’s debut, “PARADISE” – is set for release this summer. Complete details will be announced shortly. In other news, Simpson has announced the release of his first book, entitled Welcome To Paradise: My Journey. Featuring never-before-seen photos and exclusive details about Cody’s incredible life on and off stage, the official autobiography will be published by HarperCollins on October 24th. With over 4.6 million Twitter followers, more than 4 million Facebook likes, and an astonishing 141.5 million YouTube views, 16-year-old Cody Simpson is a true pop sensation. The Queensland, Australia-born singer/songwriter arrived on the scene in 2010 and quickly made a name for himself via a series of singles and videos as well as innumerable TV and concert appearances. Simpson’s debut album, “PARADISE,” arrived in October 2012. With its refreshing blend of contemporary high-energy with acoustic guitar-driven beach pop, the album – which includes the hit singles, “Wish U Were Here (Feat. Becky G)” and “Got Me Good” – confirmed Cody as more than just a worldwide multimedia phenomenon – he’s a distinctive and original artist in his own right.